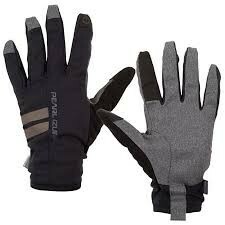 The Escape Thermal Glove is ideal for cycling, running or anytime you need lightweight warmth. Ideal for cycling, running or anytime you need lightweight warmth, the Escape Thermal Glove features an all-new micro-suede synthetic palm material. You'll obsess over the feel of this smooth, supple, yet exceptionally durable fabric, which boosts the glove's function and modern appeal. SELECT Thermal fabric on the back of hand allows for movement while providing warmth, conductive synthetic leather index finger and thumb pads offer touchscreen compatibility, and black reflective accents add trendsetting style and safety.